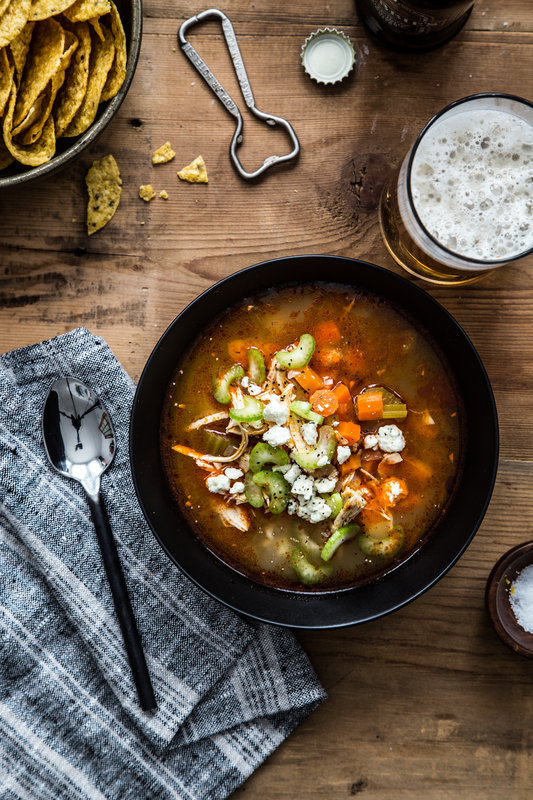 Instant Pot Buffalo Chicken Soup turns your favorite game day appetizer into one mouth watering main course! Spicy and satisfying! I’m loving my Instant Pot, guys! I received mine as a Christmas gift and I couldn’t be more into it. It took a little practice but It’s been used at least twice a week since I got it. I love how you can sauté and pressure cook all in the same pot saving both time and dishes. It has really come in handy in the last 2 weeks making various versions of chicken soup. Our entire family has been sick on and off for a couple of weeks and chicken soup has been on a constant rotation. 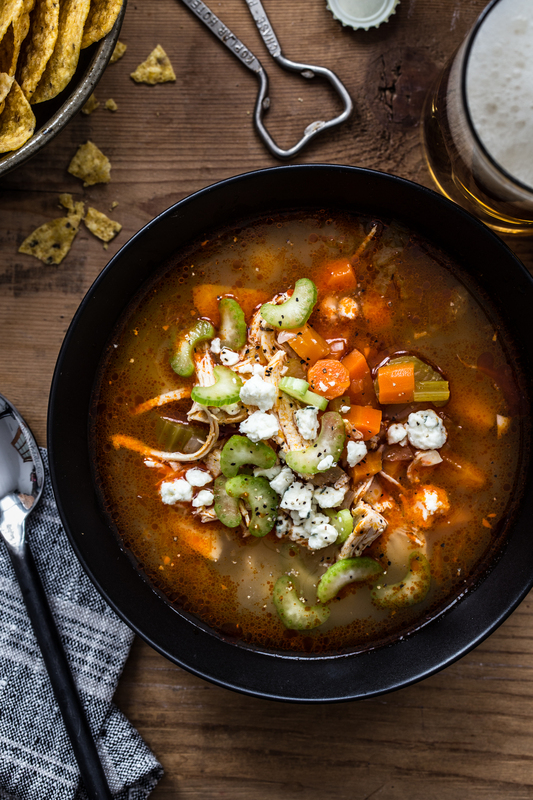 This Instant Pot Buffalo Chicken Soup is just one of the spicier versions of chicken soup that has graced our table this month. The base of my Buffalo Chicken Soup is a classic chicken soup with the addition of the Buffalo Chicken Wings key ingredient: Frank’s Red Hot. I went heavy on the carrots and celery (just like I do when enjoying a big platter of chicken wings) and then topped off each bowl with some freshly sliced celery and crumbled blue cheese. 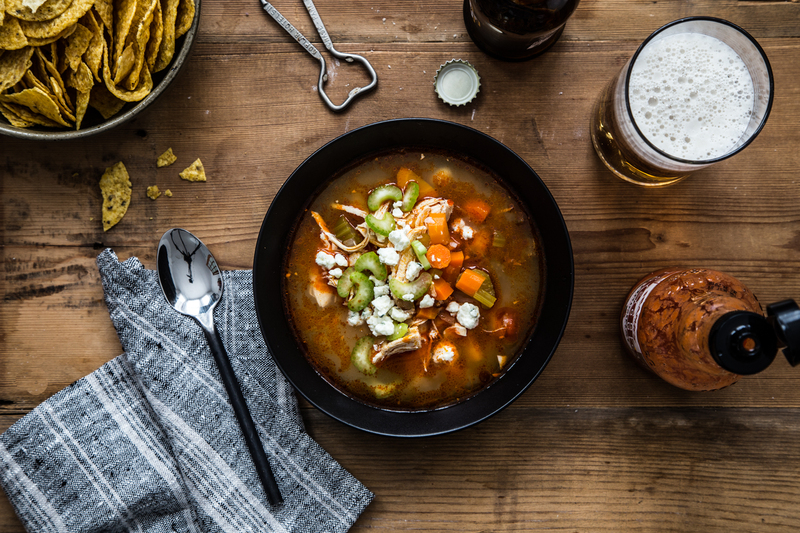 The result is all the flavors of my favorite game day appetizer in cozy soup form. As our finale to Soup-er Bowl week, I’m sharing my recipe for Instant Pot Buffalo Chicken Soup, Courtney is sharing her recipe for her Crock Pot Chicken Gnocchi Soup with Roasted Red Peppers, and Melanie is sharing her Lemon Dill Chicken Noodle Soup. It’s been a great week of soup and friends and it’s hard to believe we’re already at the end. Also, if you haven’t had a chance to enter our Le Creuset 5.5 Quart Dutch Oven giveaway yet, there’s still time! Just fill out the entry form below for a chance to win. Press the sauté button on the Instant Pot. Add butter and olive oil to the inner pot and allow butter to melt. Add carrots, celery, and garlic and cook, stirring occasionally, until slightly softened, about 7 minutes. Add broth, hot sauce, and chicken breasts to the pot. Lock on lid and cook on high pressure for 6 minutes. Allow pot to release pressure naturally for 10 minutes then quick release the remaining pressure. Remove chicken and shred with a fork. Stir shredded chicken back into the soup and adjust seasoning with salt and pepper to taste. Ladel soup into bowls and top with sliced celery and blue cheese and serve. Thank you to Le Creuset for offering the giveaway! Can NOT wait to get this in my Instant Pot – all that blue cheese is screaming my name! People really love that instant pot! My husband usually picks veggies out of soups, but he ate 2 big bowls of this soup, veggies included. He says this is a must during the winter at least weekly. What does Vent Naturally mean? Hi Megann, It means to allow the Instant Pot to depressurize at it’s own pace. Don’t release the valve at the top. Made this tonight and loved it! Satisfying and tasty, perfect for a cold winter night. Thank you!